Leó Szilárd (Hungarian: Szilárd Leó; German: Leo Spitz until age 2; February 11, 1898 – May 30, 1964) was a Hungarian-American physicist and inventor. He conceived the nuclear chain reaction in 1933, patented the idea of a nuclear reactor with Enrico Fermi, and in late 1939 wrote the letter for Albert Einstein's signature that resulted in the Manhattan Project that built the atomic bomb. He also conceived the electron microscope. He conceived the linear accelerator (1928, not knowing of Gustav Ising's prior 1924 journal article and Rolf Widerøe's operational device), and also the cyclotron. Szilárd himself did not build all of these devices, or publish these ideas in scientific journals, and so credit for them often went to others. As a result, Szilárd never received the Nobel Prize, but others were awarded the Prize as a result of their work on two of his inventions. He was born in Budapest in the Kingdom of Hungary, and died in La Jolla, California. Szilárd was born in 1898 to middle-class parents in Budapest, Hungary. 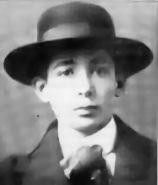 His parents, both Jewish, Louis Spitz, a civil engineer, and Thekla Vidor, raised Leó on the Városligeti Fasor in Pest, Hungary. Despite having a religious background, he later became an agnostic. From 1908–1916 Leó attended Reáliskola high school in his home town. Showing an early interest in physics and a proficiency in mathematics, in 1916 took the Eötvös Prize, a national prize for mathematics. He enrolled as an engineering student at Budapest Technical University in 1916. The following year the Austro-Hungarian Army drafted him as an officer-candidate. Prior to his regiment being sent to the front lines, Szilárd fell ill with Spanish Influenza and he was returned home for hospitalization. Later he was informed that his regiment had been nearly annihilated in battle, so the sickness probably saved his life. He was discharged honorably at the end of the war. In 1919 he resumed engineering studies at Budapest Technical University but soon decided to leave Hungary due to the chaotic political situation in Hungary following the first World War. Szilárd continued engineering studies at Technische Hochschule (Institute of Technology) in Berlin-Charlottenburg. He soon changed to physics there and took physics classes from Einstein, Planck, and Max von Laue. His dissertation on thermodynamics Über die thermodynamischen Schwankungserscheinungen (On The Manifestation of Thermodynamic Fluctuations), praised by Einstein, won top honors in 1922. In 1923 he was awarded a doctorate in physics from Humboldt University of Berlin. In London, where Southampton Row passes Russell Square, across from the British Museum in Bloomsbury, Leo Szilárd waited irritably one gray Depression morning for the stoplight to change. A trace of rain had fallen during the night; Tuesday, September 12, 1933, dawned cool, humid and dull. Drizzling rain would begin again in early afternoon. When Szilárd told the story later he never mentioned his destination that morning. He may have had none; he often walked to think. In any case another destination intervened. The stoplight changed to green. Szilárd stepped off the curb. As he crossed the street time cracked open before him and he saw a way to the future, death into the world and all our woes, the shape of things to come. Szilárd first attempted to create a nuclear chain reaction using beryllium and indium, but these elements did not produce a chain reaction. In 1936, he assigned the chain-reaction patent to the British Admiralty to ensure its secrecy (GB 630726 ). Szilárd also was the co-holder, with Nobel Laureate Enrico Fermi, of the patent on the nuclear reactor (U.S. Patent 2,708,656). In 1938 Szilárd accepted an offer to conduct research at Columbia University in Manhattan, and moved to New York, and was soon joined by Fermi. After learning about the successful nuclear fission experiment conducted in 1939 in Germany by Otto Hahn, Fritz Strassmann, Lise Meitner, and Otto Robert Frisch, Szilárd and Fermi concluded that uranium would be the element capable of sustaining a chain reaction. Szilárd and Fermi conducted a simple experiment at Columbia and discovered significant neutron multiplication in uranium, proving that the chain reaction was possible and enabling nuclear weapons. Szilárd later described the event: "We turned the switch and saw the flashes. We watched them for a little while and then we switched everything off and went home". He understood the implications and consequences of this discovery, though. "That night, there was very little doubt in my mind that the world was headed for grief". 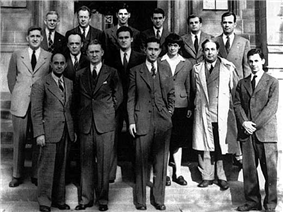 The Metallurgical Laboratory scientists, with Szilárd third from right. Szilárd was directly responsible for the creation of the Manhattan Project. He drafted a confidential letter to Franklin D. Roosevelt explaining the possibility of nuclear weapons, warning of Nazi work on such weapons and encouraging the development of a program which could result in their creation. In August, 1939 he approached his old friend and collaborator Albert Einstein and convinced him to sign the letter, lending his fame to the proposal. The Einstein–Szilárd letter resulted in the establishment of research into nuclear fission by the U.S. government and ultimately to the creation of the Manhattan Project; FDR gave the letter to an aide, General Edwin M. "Pa" Watson with the instruction: "Pa, this requires action!" Later, Szilárd relocated to the University of Chicago to continue work on the project. There, along with Fermi, he helped to construct the first "neutronic reactor", a uranium and graphite "atomic pile" in which the first self-sustaining nuclear chain reaction was achieved in 1942. As the war continued, Szilárd became increasingly dismayed that scientists were losing control of their research to the military, and argued many times with General Leslie Groves, military director of the project. His resentment towards the U.S. government was exacerbated by his failure to prevent the destructive use of the atomic bomb through having a test explosion that could be witnessed by Japanese observers who would then have the opportunity to surrender and spare lives. Szilárd became a naturalized citizen of the United States in 1943. In 1932, Szilárd read the science fiction novel The World Set Free by H. G. Wells, a book which he said made a great impression on him. As a scientist, he was the first person to conceive of a device that, using a nuclear chain reaction as fuel, could be used as a bomb. As a survivor of the political and economic devastation in Hungary following World War I, which had been eviscerated by the Treaty of Trianon, Szilárd developed an enduring passion for the preservation of human life and freedom, especially freedom to communicate ideas. He hoped that the U.S. government would not use nuclear weapons because of their potential for use against civilian populations. Szilárd hoped that the mere threat of such weapons would force Germany and/or Japan to surrender. He also worried about the long term implications of the usage of nuclear weapons, predicting that their usage by the United States would start a nuclear arms race with Russia. He drafted the Szilárd petition advocating demonstration of the atomic bomb. However with the European war concluded and the U.S. suffering many casualties in the Pacific Ocean region, the new U.S. President Harry Truman agreed with advisers and chose to use atomic bombs against Hiroshima and Nagasaki over the protestations of Szilárd and other scientists. In 1947, Szilárd switched his field of study from physics to molecular biology, working extensively with Aaron Novick. The change is widely credited to his recoil at the horror of atomic weapons but it was, at least in part, because he was dismissed from the Manhattan Project by its military head, Gen Leslie Groves, who suspected him of having Russian sympathies. This fear that he was a security risk subsequently prevented him from getting any work on nuclear-related projects. In his new field, he gave essential advice to Theodore Puck and Philip I. Marcus for their first cloning of a human cell in 1955. In February 1950 Szilárd proposed a cobalt bomb, a new kind of nuclear weapon using cobalt as a tamper, which he said might destroy all life on the planet. U.S. News & World Report featured an interview with Szilárd in its August 15, 1960 issue, "President Truman Didn't Understand." He argued that "violence would not have been necessary if we had been willing to negotiate." In 1961 Szilárd published a book of short stories, The Voice of the Dolphins, in which he dealt with the moral and ethical issues raised by the Cold War and his own role in the development of atomic weapons. The title story described an international biology research laboratory in Central Europe. 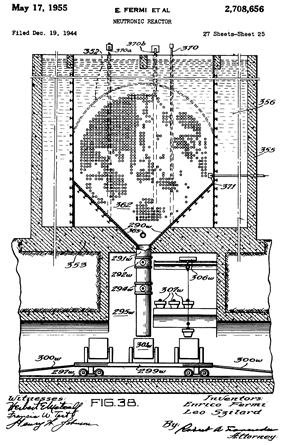 This became reality after a meeting in 1962 with Victor F. Weisskopf, James Watson and John Kendrew. When the European Molecular Biology Laboratory was established, the library was named The Szilárd Library and the library stamp features dolphins. Szilárd married Gertrud Weiss in 1951. In 1960, Szilárd was diagnosed with bladder cancer. He underwent cobalt therapy at New York's Memorial Sloan-Kettering Hospital using a cobalt 60 treatment regimen that he designed himself. He was familiar with the properties of this isotope from his work on the cobalt bomb. A second round of treatment with an increased dose followed in 1962. The doctors tried to tell him that the increased radiation dose would kill him, but he said it wouldn't, and that anyway he would die without it. The higher dose did its job and his cancer never returned. This treatment became standard for many cancers and is still used. In 1962, Szilárd was part of a group of scientists who founded the Council for a Livable World. The Council's goal was to warn the public and Congress of the threat of nuclear war and encourage rational arms control and nuclear disarmament. He spent his last years as a fellow of the Salk Institute in San Diego alongside his old friend Jacob Bronowski. In May 1964, Szilárd died in his sleep of a heart attack at the age of sixty-six. In February 2014, the UCSD Library announced that they received grant funding from the National Historical Publications and Records Commission (NHPRC) to digitize its collection of Szilard's papers, extending from 1938 - 1998. The crater Szilárd (34.0°N, 105.7°E, 122 km dia.) on the far side of the Moon is named after him. ^ a b Jardine, Lisa (4 October 2013). "A Point of View: The man who dreamed of the atom bomb". ^ Telegdi, V. L. (2000). "Szilard as Inventor: Accelerators and More". Physics Today 53 (10): 25. ^ William Lanouette, Bela A. Silard (1992). Genius in the shadows: a biography of Leo Szilard: the man behind the bomb. C. Scribner's Sons. p. 167. ^ Nina Byers. "Fermi and Szilard". Both Enrico and Leo were agnostics. ^ Blumesberger et al (2002:1355). ^ L. Szilárd (1929) "Über die Entropieverminderung in einem thermodynamischen System bei Eingriffen intelligenter Wesen" (On the reduction of entropy in a thermodynamic system by the intervention of intelligent beings), Zeitschrift für Physik, 53 : 840-856. Available on-line in English at: Aurellen.org. ^ Szilard, L. (1929) ‘On the Decrease of Entropy in a Thermodynamic System by the Intervention of Intelligent Beings’, in "The Collected Works of Leo Szilard: Scientific Papers," MIT Press, 1972, p 120-129. ^ a b Rhodes (1986:292-293). ^ Bethe, Hans A. (2000-03-27). "The German Uranium Project". Physics Today Online 53 (7): 34. ^ The Atomic Heritage Foundation. "Einstein's Letter to Franklin D. Roosevelt". Retrieved 2007-05-26. ^ The Atomic Heritage Foundation. "Pa, this requires action!". Retrieved 2007-05-26. ^ Jacob Bronowski (writer, presenter). "Knowledge or Certainty". The Ascent of Man. 41:14 minutes in. ^ "Brief History". European Molecular Biology Laboratory. Retrieved 2011-02-22. ^ "Szilárd Library". European Molecular Biology Laboratory. Retrieved 2011-02-22. ^ Esterer & Esterer (1972:148). ^ Dolores Davies. "Materials Documenting Birth of Nuclear Age to be Digitized". Bess, Michael (1993). Realism, Utopia, and the Mushroom Cloud: Four Activist Intellectuals and their Strategies for Peace, 1945-1989. University of Chicago Press. Blumesberger, Susanne; et al (2002). Handbuch österreichischer Autorinnen und Autoren jüdischer Herkunft 1. K. G. Saur. Esterer, Arnulf K.; Esterer, Luise A. 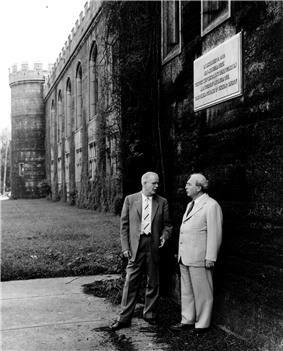 (1972). 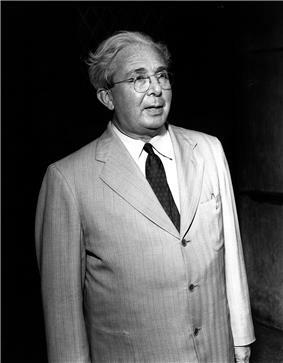 Prophet of the Atomic Age: Leo Szilárd. New York: Julian Messner. Frank, Tibor (2008). Double exile: migrations of Jewish-Hungarian professionals through Germany to the United States, 1919-1945. Exile Studies 7. Germany: Peter Lang. Lanouette, William; Silard, Bela (1992). Genius in the Shadows: A Biography of Leo Szilárd: The Man Behind The Bomb. New York: Charles Scribner's Sons. Szilárd, Leo; Weiss-Szilárd, Gertrud (1978). Leo Szilárd: His Version of the Facts : Selected Recollections and Correspondence. Spencer R. Weart (ed.). Cambridge, MA. : The MIT Press. Szilárd, Leo (1992). The Voice of the Dolphins: And Other Stories (Expanded edition from 1961 original ed.). Stanford, CA. : Stanford University Press.